Traffic Booster is powerful, one-of-a-kind software that makes search engine submission and optimisation easy. Booster will submit your website to over 400 search engines and directories. It does the boring, time-consuming work of submission and resubmission for you. Plus, you can resubmit any time you like, with one click. Every month, Booster adds in any new search engine definitions and directories. Your website is always submitted to the most popular search engines, so you stay ahead. Booster provides you with easy-to-use tools to help you optimise your website. Traffic Booster helps you optimise aspects of your website that search engines use to determine where to place your site in their listings. 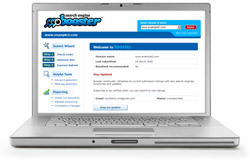 Booster provides you with all the tools, information and suggestions you need. For example, Booster's Website Analysis tool analyses your website in detail and shows you specific changes you can make to improve your performance in search engine listings. Booster's step-by-step wizard is easy to use and explains what to do and why in clear, everyday language. Just follow the simple steps to give your website a search performance boost.